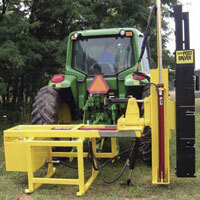 The rear sliding mounted driver is suggested for those who have multiple uses for their tractor. 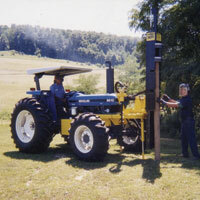 Auger System #05200 - Uses the driver as mounting hook-up. Delivers 10 HP and is used for pilot holes in exteme rough and rocky soils. 4 1/2" diameter. P.T.O. Hydraulic Pump, Tank and Filter #05500 - Used to extend life and/or upgrade the tractor's own hydraulic system. The front stationary/sliding tractor mounted driver is designed primarily for four-wheel drive tractors. This option is popular with contractors who work on difficult terrain. Unit Weight - 1975 lbs.